The Sustainable Brands Conference is an annual conference aimed at creating "...an international community of learning and action focused on understanding and leveraging the role of brands in shaping a flourishing future. 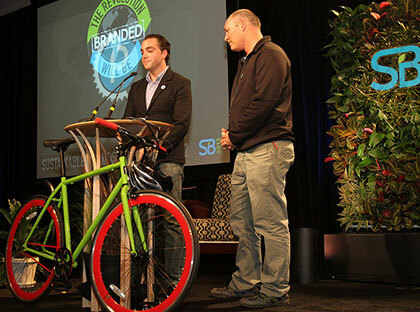 The Sustainable Brands Conference is ground zero for sustainability, brand and innovation professionals who come together from around the world to be inspired, engaged and equipped to succeed by building the better brands of tomorrow, while building a network of likeminded colleagues who can help." Part of the Sustainable Brands Conferences is the annual Sustainable Brands Innovation Open (SBIO) - a competition created to "catalyze the progress and impact of the next generation of sustainable brands. These are the startups who, given the support and exposure, can contribute to flourishing future economically, socially, and environmentally." Bike & Park is proud to have won the People's Choice Award in the 2012 SBIO competition and we here at Bike & Park had an excellent experience at the competition.